Small businesses in America account for some big numbers. According to the U.S. government’s Small Business Administration, there are some 28 million small businesses in America, providing 55 percent of U.S. jobs and 66 percent of all net new jobs since the 1970s. Many of these small businesses offer their employees ways to save for retirement. If you work for a small business, there are some plans that the government has created specifically for these employers. Employers may choose to offer one of them, though they are not required to do so. 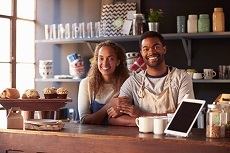 If you own a small business, the Department of Labor’s Employee Benefits Security Administration, or EBSA, offers a helpful brochure that walks you through retirement plan options. The Internal Revenue Service does the same in Retirement Plans for Self-Employed People. SIMPLEs. The Savings Incentive Match Plan for Employees, usually called a SIMPLE, is available to companies that employ fewer than 100 people. If your employer offers a SIMPLE and you earn $5,000 or more, you must be included in the plan. Also, your employer must contribute to your account following one of two formulas—either by matching 3 percent of the amount each participating employee contributes, or by contributing 2 percent of each eligible employee’s compensation whether or not they participate. There are two variations of SIMPLEs: the standard SIMPLE IRA and the SIMPLE 401(k). With a SIMPLE IRA, all of the contributions are vested and belong to you from the beginning. So if you leave your job, you can take the money with you. You must, however, wait two years before you can move your account or withdraw any money, or you face a 25 percent penalty on whatever you transfer or take out, which is much steeper than the 10 percent that applies to other employer plans. As the name implies, the SIMPLE 401(k) is set up as a 401(k). So your contributions go into an account that’s part of the plan, rather than to an IRA. In 2018, the contribution limit for both a SIMPLE IRA and SIMPLE 401(k) is $12,500, plus a catch-up contribution of $3,000 if you’re 50 or older. SEPs. If your employer has 25 or fewer employees, your retirement plan may be a Simplified Employee Pension, or SEP, which is an IRA in your name. You’re 100 percent vested in all money in your account, and you choose the investments from among those offered by the plan provider your employer selects. With a SEP, you (the employee) do not contribute. Your employer makes the entire contribution, though the amount may vary from year to year. The annual limit on employer contributions is up to 25 percent of your salary, or $54,000 in 2017, whichever is less. But each eligible employee must be treated the same way. If 25 percent of the boss’s salary is added to his or her SEP IRA, then 25 percent of your salary must be added to your account. Rules on SEP IRA distributions are similar to those for traditional IRAs. Anyone with a SEP is required to start required minimum distributions by age 70½. As with an IRA, you cannot borrow against your account balance. And if you make a SEP withdrawal before age 59½, you’ll face a 10 percent penalty and regular income taxes on both the contributions to the account and your investment earnings—just as with a traditional IRA. If your employer has chosen a profit-sharing or money-purchase plan, your employer can contribute the full amount to your account, to 25 percent of your salary, or $55,000 in 2018, whichever is less. These plans are sometimes described as varieties of a Keogh plan (though the term is rarely used these days). In a profit-sharing plan, the amount your employer adds each year depends on how well the company has done. The amount could range from $0 to the maximum, but an employer has to contribute to all employees’ accounts at the same rate. If the boss gets 25 percent of salary, so do you. If the boss gets 10 percent, you get 10 percent. In a money-purchase plan, your employer is committed to adding a certain percentage of your salary each year—say 5 percent—and can contribute more if it has been a good year. Distribution rules for these plans are standard. There are penalties for withdrawals before age 59½, and mandatory minimum requirements after 70½. You have some flexibility when it comes to account rollovers. For example, you can roll money from other pensions or employer-sponsored retirement accounts into a Keogh. Or, as with a SEP, you can roll the Keogh itself into an IRA, without penalty. And, unlike SEP IRAs and other IRAs, most Keoghs let you borrow from the balance in your account.